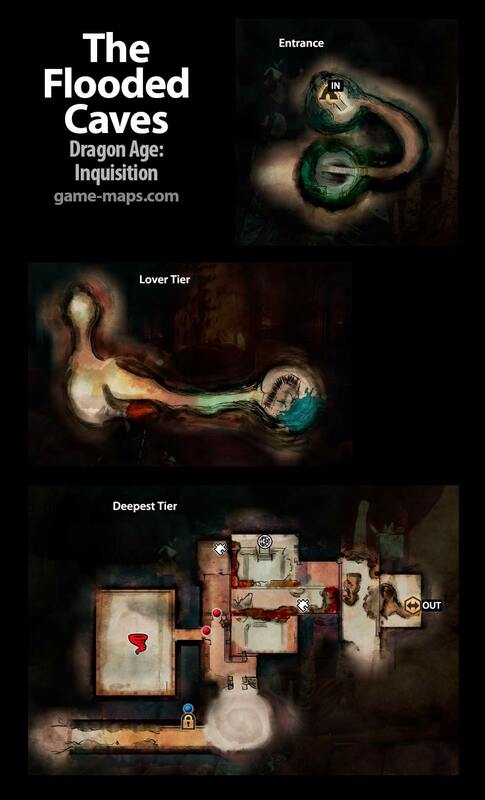 Flooded Caves - Dragon Age: Inquisition Walkthrough, Game Guide and Maps, with Quest and Locations of Camps, Merchants, Rifts, Ocularums, Astrarium, Dungeon Entrences, Landmark (POIs), Crafting Station, Mosaic Piece, Inquisition Agent, Secrets, Party Members, Bottle of Thedas and Codex Entry.
" In the 2nd floor "lower tier" there was a master spirit rune in the area where there is a skeleton and you examine it. In the top round room area." " If you have Varric in your party and right before you leave the exit, in the last room before the room with the stairs to the exit, (2nd last room). In the water, there are 2 nugs. If you kill them, he will slightly disapprove and mention how harmless they are, and how it was his brother's favorite food with elfroot."